Water damage can occur through a variety of ways such as a leak behind a wall or a burst pipe. It can destroy your possessions and even harm the structural integrity of your property by warping itself your flooring, seeping through your drywall, and rotting inside the foundation. 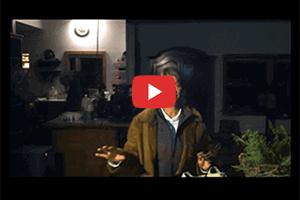 Although water damage by itself can cause devastating damage to your property, it’s after effects can leave you with considerable damage as well. A mold infestation only needs as little as 24 hours to start growing and spreading. This can be difficult to prevent since water can soak deep into your carpet, furniture, and your walls. That’s why when this occurs, you need mold removal specialists who can also handle your water damage restoration. 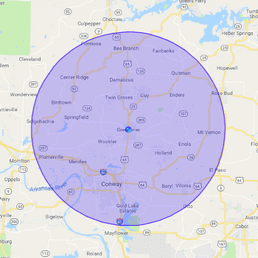 When you choose 911 Restoration of Central Arkansas you get a team that is locally owned and operated making us the perfect choice for a fast response in Pulaski County. Whether you live in Maumelle or Little Rock you can count on us arriving within 45 minutes of your call. So what are you waiting for? Call us for your water damage and mold removal needs today! Unless your water damage is dramatic like when an appliance hose ruptures, chances are that your water damage will be built up over time. The longer your possessions and house sit with water surrounding them, the greater the impact on your property. That’s why as soon as you notice water damage, your first step after stopping the source is to call the team at 911 Restoration for your water damage restoration. We know that water damage can strike at any time, which is why we make sure we are available 24/7/365 to respond immediately. Besides our availability, we also employ technicians that are IICRC-certified and have been trained further past the certification so you know you’re getting nothing but the best service. Only the latest water extraction equipment and commercial dryers will do when it comes time to get your property completely dried out. Our local availability enables us to serve all of Pulaski County quickly and efficiently regular life occurs before you know it. In addition to our expertise with any water damage, we also specialize in inspecting the property to help protect against the long-term effects of water damage. Any part of the property that is dark or hard to reach like a flooded basement or crawlspace can create a perfect breeding ground for mold if left unchecked. Once mold is found, that’s when mold removal becomes a necessity. Mold only needs 24 hours to start growing. The rate and speed of growth are dependent on the amount of moisture in the property. Regardless of the speed of growth, mold only harms the property further the longer it’s allowed to exist. There are two main ways that mold can harm a property owner. Mold eats away at the organic materials that make up your home. Materials like sheetrock, wooden support beams, and even some flooring are all potential mold victims. In addition to property damage, mold can affect a person’s health by compromising their ability to breathe properly and contributes to other symptoms like headaches. For these and other reasons, mold removal is a priority that can’t be ignored for residents of Pulaski County. Our approach to mold removal is to contain and neutralize the mold before removing it. Mold can become airborne through mold spores by agitation. Containment allows us to negate its ability to spread beyond the point of origin. We use the latest equipment to accomplish this like vapor barriers. 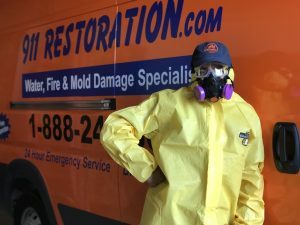 Once you suspect mold, call the mold removal team at 911 Restoration of Central Arkansas and we’ll be there for you within 45 minutes of your call. All of our mold removal technicians are IICRC-certified and we provide our services at amazing value for our Pulaski County customers.